Every spring we mow our 3 acre meadow to allow some sunshine to get to the ground and make room for new growth. When we went to photograph the freshly mowed prairie grasses we noticed this beautiful Red-tailed Hawk perched in a tree over the meadow. We know hawks are intelligent birds, but this hawk was something special. The Hawk appeared to be watching the mower go by, and waiting for rats and other small prairie mammals to come into view, like he knew that the mowing would make them more visible. Incredible! Not only was this Red-tailed Hawk showing us how he hunts, but he was also flying beautifully, almost posing for the camera. After a few attempts at catching something, he finally caught a rat with his talons and flew it into a nearby tree to show off his prize. A frequent Arboretum photographer, Rosemary, was able to capture the photo below. Conservation Status: Red-tailed hawks were showing decreased numbers in the 1960s but have since improved with some population growth. 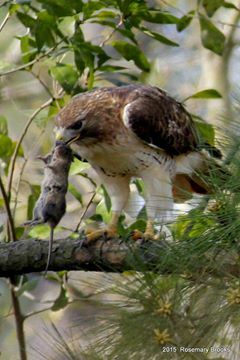 This could be because in some areas of North America, Red-tailed hawks are adapting and opting to nest within in cities. Habitat: Red-tailed Hawks reside in prairies, meadows, woodlands, mountainous terrain, roadsides and any area that provides an open area for them to hunt. They will live anywhere from forests to deserts with only a utility pole to nest in. Nesting: When Red-tailed Hawks are courting, you will see them circling each other high in the sky while making shrill cries. Males may pass freshly caught prey to the female while they are in flight, a spectacular flight show of quick maneuvers and high diving. 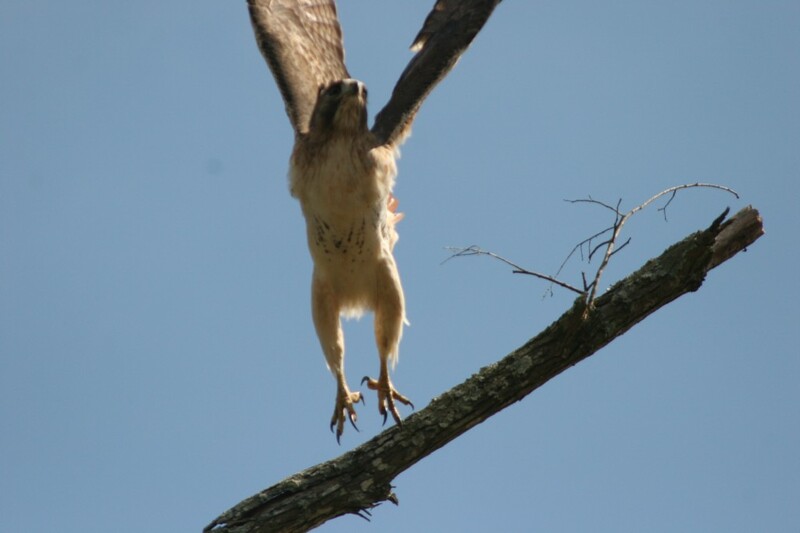 Thank you Rosemary for taking this amazing picture of the Red-tailed Hawk at the Houston Arboretum!